Nov 4, 2013 - N.A. Menlo Park could serve as the base station to visit other parts of the Bay area. However, there is so much in the immediate vicinity there is no need to venture further out. Besides Stanford University, the area has many parks, gardens, museums, hiking trails and historical sites. 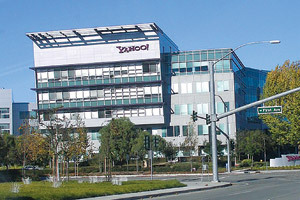 Yahoo Headquarters in nearby Sunnyvale. Silicon Valley is known the world over as the iconic center of Internet and technology developments. But in contrast to the financial center of downtown San Francisco, Menlo Park is spread out and much-more laid back – more of a California life-style. Nearby are some of the highest-price residential real estate in the country, notably Woodside, Los Altos and Los Altos Hills. Many of the estates are set on large forested lots with horse-riding trails. So, if exploring the San Francisco Bay area has been on your list, consider a stay in the technology incubator of the world, the Silicon Valley. If you would like to see venture capitalists in action (or if you are one! 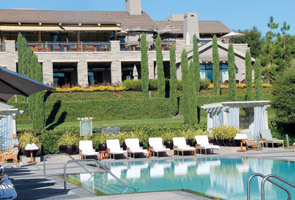 ), the Rosewood Sand Hill Hotel may be just the ticket. 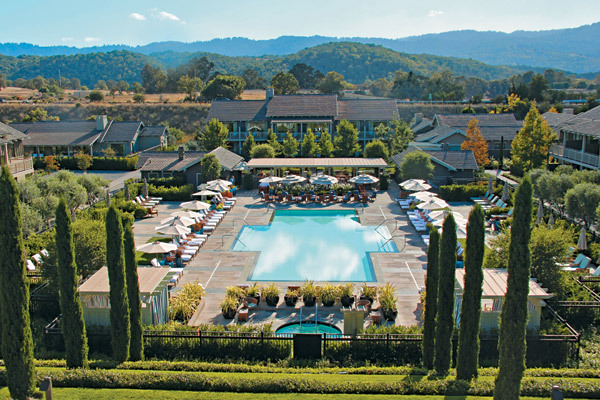 Rosewood Sand Hill is located on a 16-acre site in Menlo Park, California, just one mile west of the Stanford University campus and adjacent to some of the nation’s foremost venture capital and private equity firms. Rosewood Sand Hill offers a comfortable and stylish retreat. Interiors are classic Northern California, mixing European elegance and tradition with the quintessentially casual, yet sophisticated vibe of the West Coast. The exteriors meld the rich heritage of relaxed California Ranch architecture with fragrant gardens and stunning views of the Santa Cruz Mountains. The hotel has a strong following from visiting professionals to Stanford University as well as technology companies. The Madera is an award winning restaurant on the hotel grounds. 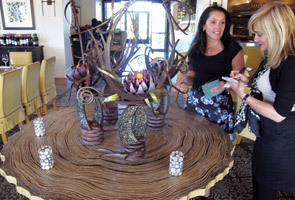 The centerpiece of the Madera restaurant was an intricately designed chocolate sculpture created by Executive Pastry Chef Mellisa Root. Admiring the sculpture is Sharon Cabral, Director of Sales & Marketing for the Rosewood Sand Hill Hotel, and Lauren Lipsky, account executive for DREAM HOMES INTERNATIONAL. 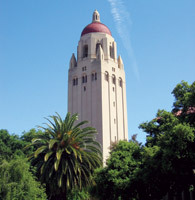 Stanford University is located in Menlo Park. 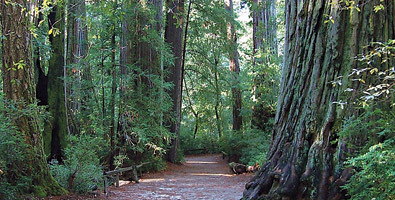 The area has many large redwood trees, including the nearby Big Basin Redwoods State Park in the Santa Cruz Mountains. 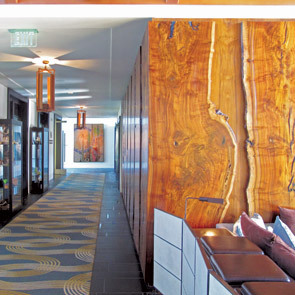 The hotel features numerous exceptional works by accomplished artists, connecting the hotel with the local artistic community. 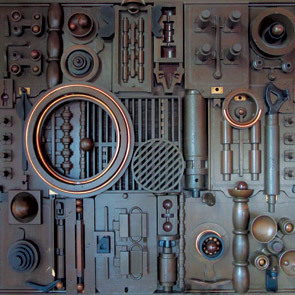 All the works in the collection were chosen to represent the finest examples of contemporary art. Rosewood Sand Hill features 121 elegantly appointed guest rooms with state-of-the-art in-room technology. Hotel amenities include Sense® spa, which includes 13 treatment rooms, a fitness room and outdoor pool, as well as well-equipped and beautifully designed meeting and special event spaces. The guestrooms and suites are inspired by Menlo Park’s local architectural tradition and expressive of the transparency between the indoors and outdoors. Spacious accommodations feature thoughtful furnishings, original art, large marble baths and state-of-the-art technology. All offer private balconies or terraces with views of the Santa Cruz Mountains and/or courtyard gardens. Technology features include Control4 automation which uses a single remote to control lighting, room temperature, television, music and video systems. Guests can also use the remote to make service requests such as valet, housekeeping, room service, spa appointments and more. Other in-room technological amenities include the Philips SoundBar, a one-piece integrated audio and video system that delivers full multi-channel surround sound providing a full home theater experience with excellent sound and picture quality. The Hotel is pet-friendly, welcoming pets with their own luxury mat and a set of dishes. As a 5-star luxury hotel, its room rates are at the 5-star level varying from $500 - $1000 per night. Special promotions and discounts are offered from time to time. A comfortably elegant ambiance, picturesque views and outdoor terraces welcome guests and locals to Madera. Featuring an open artisan wood-burning kitchen and extensive wine list, Madera serves American cuisine that celebrates the culinary traditions of the Western United States. In addition to indoor and outdoor dining, Madera offers two private dining rooms with private terraces and cozy fireplaces. The restaurant, and adjacent lounge spill into the outdoor space and offer stunning views of the pristine local landscape. 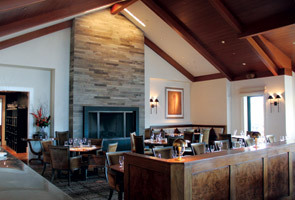 Madera is considered one of the finest restaurants in Menlo Park and in the San Francisco Bay area written up by many critics. 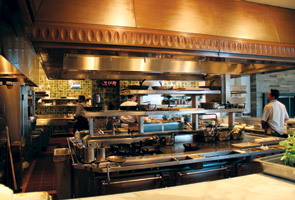 The restaurant was awarded a star by the internationally known Michelin Guide. Next to the restaurant is the Madera Lounge where soon after the hotel opened in 2009, the Madera Lounge became an “in” meeting spot for locals and visitors alike. Rosewood expanded the bar area but on Thursday nights in particular the Lounge is filled with local venture capitalists, techie types as well as hotel visitors. For more information about visiting Silicon Valley, visit Fodors.com.